To compare the prevalence of MS in patients with AN as compared to control population. The average age of the patients with AN was 32.4 years. Females (62%) were more commonly affected as compared to males (38%) [Table 1] and [Table 2], [Graph 1]. Grade 4 – 96.7% had MS, whereas 3.3% did not have MS [Table 3]. On comparing the severity of AN with components of MS and BMI, we found that AN neck severity grading has statistically significant correlation with all the components of MS and BMI [Table 4] and [Graph 2]. The prevalence of metabolic syndrome in cases and controls was determined by comparing each component of MS between the cases and controls [Table 5]. Out of the 100 cases of AN, 46% cases were obese (BMI >24) and as compared to 33% obese controls. The difference was statistically significant [Table 6]. Considering all the components of MS and comparing the results between the cases and the controls, 70 patients with AN had MS and only 17 controls had MS. The odds ratio was 11.39, and thus the difference was statistically significant [Table 7]. Sinha S, Schwartz RA. Juvenile acanthosis nigricans. J Am Acad Dermatol 2007;57:502-8. Barbato MT, Criado PR, Silva AK, Averbeck E, Guerine MB, Sá NB, et al. Association of acanthosis nigricans and skin tags with insulin resistance. An Bras Dermatol 2012;87:97-104. Guran T, Turan S, Akcay T, Bereket A. Significance of acanthosis nigricans in childhood obesity. J Paediatr Child Health 2008;44:338-41. Balaji C, Vindhya M, Gurukul S. Significance of acanthosis nigricans as marker for metabolic syndrome. World J Med Sci 2014;10:295-8. Puri N. A study of pathogenesis of acanthosis nigricans and its clinical implications. Indian J Dermatol 2011;56:678-83. Zayed A, Sobhi RM, Abdel Halim DM. Using trichloroacetic acid in the treatment of acanthosis nigricans: A pilot study. J Dermatolog Treat 2014;25:223-5. Ehsani A, Noormohammadpour P, Goodarzi A, Mirshams Shahshahani M, Hejazi SP, Hosseini E, et al. Comparison of long-pulsed alexandrite laser and topical tretinoin-ammonium lactate in axillary acanthosis nigricans: A case series of patients in a before-after trial. Caspian J Intern Med 2016;7:290-3. Varthakavi PK, Waingankar A, Patel KL, Wadhwa SL, Khopkar U, Sengupta RA, et al. Acanthosis nigricans: A dermatologic marker of metabolic disease. Indian J Dermatol Venereol Leprol 2002;68:67-72. Treesirichod A, Chaithirayanon S, Wongjitrat N, Wattanapan P. The efficacy of topical 0.1% adapalene gel for use in the treatment of childhood acanthosis nigricans: A pilot study. Indian J Dermatol 2015;60:103. Patidar PP, Ramachandra P, Philip R, Saran S, Agarwal P, Gutch M, et al. Correlation of acanthosis nigricans with insulin resistance, anthropometric, and other metabolic parameters in diabetic Indians. Indian J Endocrinol Metab 2012;16:S436-7. Hoffmann M, Visser WI, Hough FS, Africa S. The prevalence and clinical significance of acanthosis nigricans in diabetic and non-diabetic women of mixed ancestry. J Endocrinol Metab Diabetes South Afr 2015;20:87-91. Stoddart ML, Blevins KS, Lee ET, Wang W, Blackett PR, Cherokee Diabetes Study. et al. Association of acanthosis nigricans with hyperinsulinemia compared with other selected risk factors for type 2 diabetes in cherokee Indians: The cherokee diabetes study. Diabetes Care 2002;25:1009-14. Kong AS, Vanderbloemen L, Skipper B, Leggott J, Sebesta E, Glew R, et al. Acanthosis nigricans predicts the clustering of metabolic syndrome components in hispanic elementary school-aged children. J Pediatr Endocrinol Metab 2012;25:1095-102. Kamel AM, Hassan MA, Ibrahim MY. 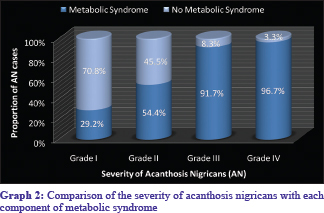 Relation between the severity of acanthosis nigricans and metabolic syndrome components. J Egypt Women's Dermatol Soc. 2013;10:75-80. Grandhe NP, Bhansali A, Dogra S, Kumar B. Acanthosis nigricans: Relation with type 2 diabetes mellitus, anthropometric variables, and body mass in Indians. Postgrad Med J 2005;81:541-4. Karadağ AS, You Y, Danarti R, Al-Khuzaei S, Chen W. Acanthosis nigricans and the metabolic syndrome. Clin Dermatol 2018;36:48-53.